Shipping containers often take a beating, traveling around the world, being exposed to freezing conditions, corrosion and rust due to seawater or when the frost has melted. Other times, contents of the shipping container may have shifted, or containers even dropped, causing shipping container doors and lockrods to warp. Our shipping container tool can benefit the opening and closing of hard to open shipping container doors that are difficult to open due to banged up doors and lockrods. Injuries often occur as a result of personnel trying to open and close difficult container doors, often the result of inappropriate techniques being used to open them. Shipping container doors are not typical doors and there are 4-5 hinges per door. The hinge pins must be lined up correctly for the doors to be free to fully open and close. Here are some likely reasons a shipping container door will not open or close. Our tool helps to address these issues. The container frame is racked so that the door gear will not operate correctly. This may be caused by cargo shifting during transit. Look at the container to make sure that the doors are aligned and level, both top and bottom. This leverage tool uses the principles of leverage to do the difficult work. By providing an extended area on which to grasp, with both hands, a more stable platform to manipulate the latch handle is achieved. 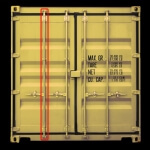 This intermodal container (also known as ISO Container, Conex Box, or Railroad Container) cargo inspection tool and leverage safety bar is to aid in opening and closing side-by-side doors found within Dismountable Shipping Cargo Container Trailer Transportation Industries (Railroad, Harbor, and Trucking Industries). Eliminates the Need for a crescent wrench, screwdriver, hammer, and crowbar which are commonly needed/used to open stuck shipping container doors.